Kill Pill resumes after a one week hiatus as a fortnightly column. Be sure to check back regularly for instalments. I didn’t write about this when it happened because I didn’t want my parents to find out about it. I’m 27 going on 17. A very wise woman friend suggested that my body may be reverting back to the state it was in at 17, because that’s where I left it developmentally when I started the pill. Though it was my “fertile glow” and congested complexion that triggered this comment, mind and spirit appear to be following suit. The event I chose to keep a secret occurred the day I got my first 100%, female-body-made, post-ovulation blood bath since 2006. It was no ordinary day and here’s why. The week after our pussycat Totoro died I had a hypnosis session with a healer by the name of Maggie Schirmer. I had never been hypnotized before. Not consciously, anyway. Educational institutions I’ve attended use similar methods, but without half the amount of disclosure: “you are going to read this, and complete this, and meet this criteria, by this time, and in this way…” However, with Maggie, I actively chose to “go under” and see what spirit had to say. She sensed Totoro had some things to share and, turns out, he did. I found myself viewing my partner and I from his perspective. Quite literally from low on the ground; and everything was framed by different colours. I saw myself doing a work out and dancing alone around the house surrounded by green light. I also became privy to what gave Totoro joy, how his body felt, his relationship with the trees, the circumstances of his death and guidance from him for my boyfriend and I. Apparently BF needs more flowers and plants in his workspace – preferably of a red hue – and I need a large, fluffy, cream-coloured cat with red and blue eyes draped around my chest and shoulders. A cat that isn’t as smart as Totoro, and is one that we’ll worry about, but rest assured she (yes, she) is going to live a long and happy life. Hours after the session I asked myself what the name of this cat is and, in response, I heard “Tink”. No, that can’t be right, I thought. My parents have a neighbour whose very sweet and very anxious fourteen-year-old cat is Tinki. I asked again and the name “Katinka” sounded in the ether. I looked up the name and discovered that Katinka means “pure” in Greek. How lovely. It took another week before I had the courage to look at cats in animal shelters. Guilt lined each click of the mouse as I viewed the plethora of wide-eyed homeless creatures around Victoria. I ran circles around myself and what I was shown in the vision: surely this cat isn’t meant to come into our lives yet? Surely I’m just scrambling to fill the void Totoro left? The backdrop to this was our home’s hollering emptiness. The space was less holy without an animal to consecrate it. The chairs, the bed, the floors, the dishes bought especially for drinking water and dry and wet food. The ache went beyond longing to witness Totoro’s delightful collection of idiosyncrasies on a daily basis. It was an ache for what an animal gives a human being that nothing else can. Through my research I discovered that the breed of the cat I’d seen in the vision was a ragdoll. These are highly sought after animals because they’re fluffy and floppy and just by looking at them you’ve earned their trust. But easy love don’t come cheap; these purebreds are selling for up to $900 on Gumtree. They’re often stolen and sold because of this. At this point in the search I felt sick and stopped – but not for long. I went to type something animal-shelter related into Google and stumbled upon Keysborough Animal Shelter. And who did I find staring back at me from the screen? A female ragdoll cat by the name of Tink with blue and red eyes. Keysborough Animal Shelter take extraordinary care of their animals. Walking into the cat enclosure felt like walking into a college dorm. Destiny’s Child played over the speakers in the area for kittens and younger cats, while classical music softly hummed in the background of the space for older cats. There were cushions and paintings and photos and windows adorning every wall. Cats to be sold together were kept together and that’s where we found Tink, because Tink came with a buddy. 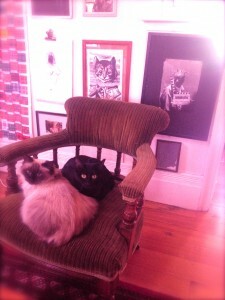 And like every other black cat anywhere, Tink’s female companion was Salem. Katinka snores and Zero (aka Salem) sits on laptops. Well, she sits on anything with electricity running through it. It isn’t just to get our attention, either. This morning we entered the lounge room to discover her sitting atop the record player. We’re thinking “Xerox” might have been more appropriate. Katinka and Zero groom each other until they fight and keep each other warm on different chairs and fill the house with joy and chaos. No shoelace is safe; they’re inside cats and they always have been. They sleep with us and sit with us – while Totoro has dibs on the garden and forest beyond eternally. We had a lovely morning before the two-hour drive to Keysborough to collect them. We took it slow and I pampered myself and tidied the house in preparation for the arrival of our new housemates. It was a sunny day and on the drive we stopped to get petrol. I went to the bathroom to discover my period. The gravity of this omen, given the circumstances, felt miraculous. It was a physiological, biological marker for letting go of the past and embracing a new beginning. Which Totoro led us to. This entry was posted in Column, Health, Opinion and tagged cats, kill pill, spirituality. Bookmark the permalink.